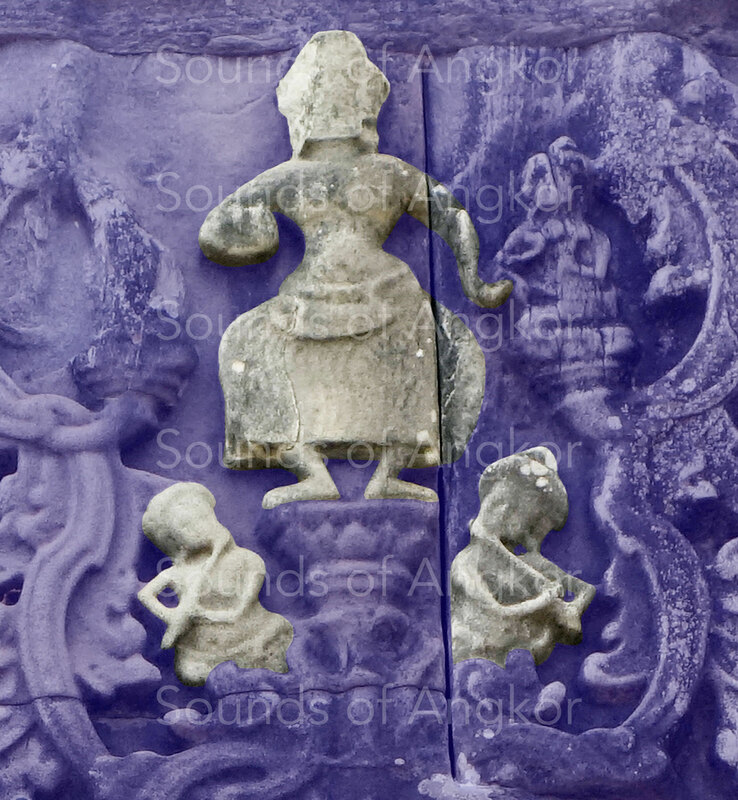 Flute - Site de soundsofangkor ! The representation of flutes are rare. Therefore, we give here an almost exhaustive overview of our discoveries. 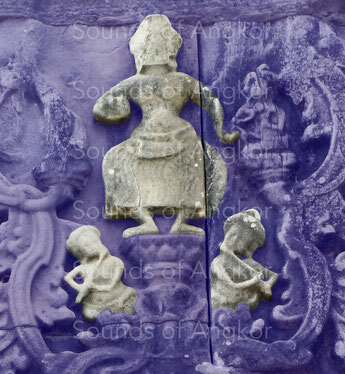 The only type existing in pre-Angkorian times is the transverse flute. There is no epigraphic occurrence in the Angkor period. In 16th century, in the north gallery of Angkor Wat, a wind instrument that could be a blockflute is also represented. 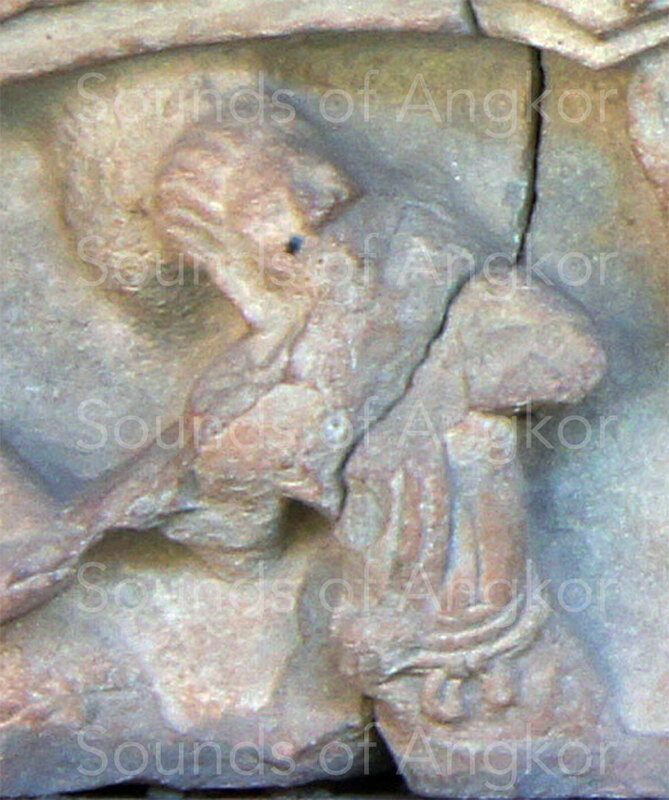 The transverse flute is visible on two lintels from Sambor Prei Kuk (7th century) exposed at the National Museum of Cambodia (photos 1, 2) and also on a bas-relief of Phnom Bakheng, in situ (3). 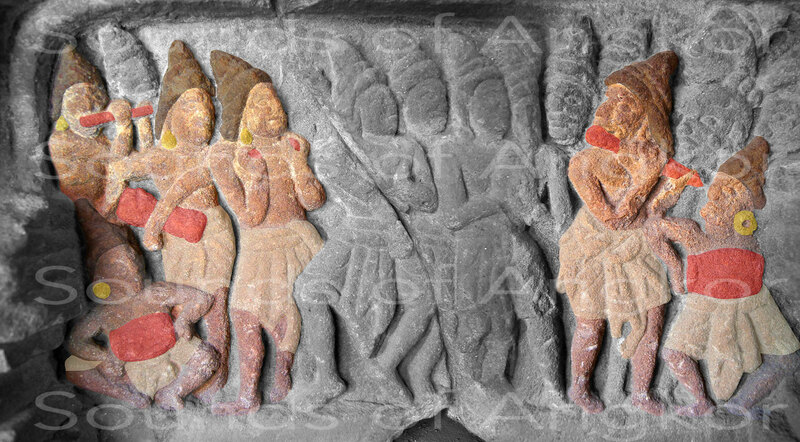 The foundation stela of Prah Kô temple (late 9th century) mentions several generic Sanskrit terms referring to servants specializing in music and singing, the names of three instruments including a flute and some words related to the playing itself. "Un grand nombre de belles danseuses, chanteuses, récitantes, musiciennes, joueuses de vīṇā et autres (instruments), habiles à frapper des cliquettes." "A large number of beautiful dancers, singers, reciters, female musicians, vīṇā players and others (instruments), skilled for knocking the rattle." A great number of beautiful dancers, singers, reciters, female musicians, zither players and others (instruments), of flute, skilled in clinking the small cymbals. The ancient Khmer word kluy appears on the pedestal of the central sanctuary of Kuk Prasat (994 AD) in a list of goods donations to the temple alongside two other instruments: "k[l]uy 1, kinara 1, chko 1" , "1 flute, 1 stick zither, 1 chko (unidentified instrument)". If the term kluy is perfectly identifiable, the nature of the flute remains unknown. However, if one refers to the Ancient Khmer, Indian and Borobudur iconography, only transverse flutes are represented. The term kluy has been transmitted in the modern Khmer (khluy). 1. Two flutes playing with drums and small cymbals. Detail of the lintel of Wat Ang Khna. Sambor Prei Kuk. 7th century National Museum of Cambodia. 2. The flute is broken. Detail of the lintel of Sambor Prei Kuk. 7th c. National Museum of Cambodia. 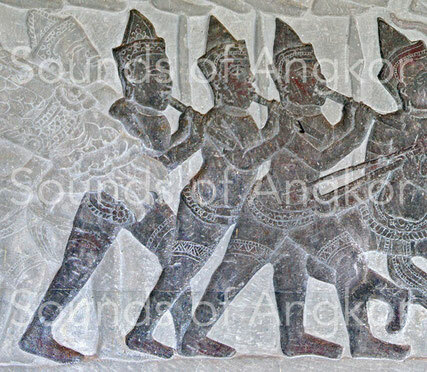 In the north gallery of Angkor Wat (16th century) appears a trio of wind instruments. 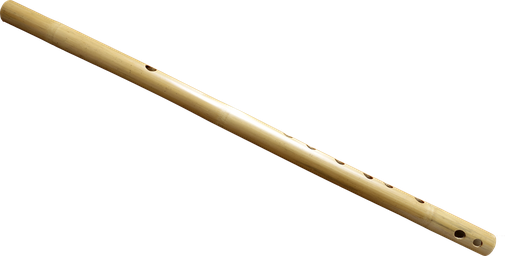 It could be either a blockflute as the modern Khmer khloy, or the ancestor of the pei ar oboe; these two instruments still existing today in Cambodia. It could also be a bamboo or brass free reed aerophone. The reed is embedded laterally near the upper end. The musician engages a few centimeters of the instrument in his mouth until covering the reed. This instrument is usually played at an angle of 45 °, which doesn't seem to be the case here. The presence of three aerophones is remarkable. Indeed, instruments, whatever their nature, are always represented unitarily or by pair. But here we have the only example that escapes this rule. The author of this bas-relief may have wished that these instruments were numerous. Sets of processional flutes (transverse flute too) still exist today in Nepal to the Newar people in the Kathmandu valley. On the other hand, we don't know of any examples of pei ar oboes ensemble more than two in Asia. Therefore, our provisional conclusion would be to consider these three instruments as blockflutes.